Determinate varieties are also known as bush tomatoes. They stop growing when fruit sets on the top bud, ripen most of their fruit in a short period, usually about 2 weeks, and then die. They generally require no staking or caging and are usually early-maturing. Pruning is not recommended. The plants and their fruit are generally smaller than indeterminate sorts. Most varieties that do well in pots are determinate. Indeterminate varieties are also called “vining” tomatoes. They grow, bloom, and produce fruit until the end of the growing season (generally first frost). These almost always require staking or caging for support, and pruning may be required. Semi-indeterminate varieties are basically indeterminate in nature, but have some determinate qualities, such as earlier yield and less need for staking. Tomatoes are usually self-fertilizing. 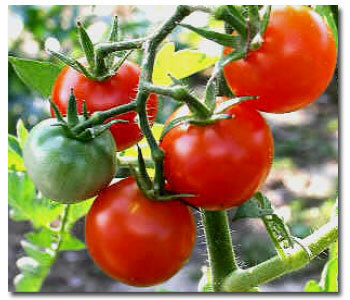 A non-hybrid tomato is one that has been allowed to self-fertilize to produce non-hybrid seed. Growers can save seed of non-hybrid tomatoes to plant the next season’s crop. 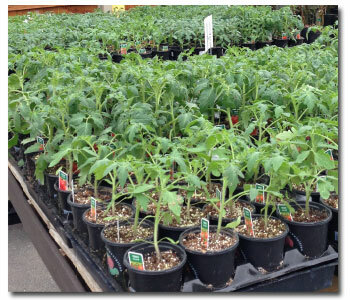 Non-hybrid tomatoes will grow true from seed. Old, non-hybrid, cultivated varieties are often known as heirloom varieties. Hybrid tomatoes have two genetically different parents that are crossed each year to produce the hybrid tomato seed. Although hybrid tomatoes do produce seed, the seeds will not have the characteristics of the hybrid–though it can be fun to plant them just to see what you get! Beefsteak tomatoes are known for large size and thick, meaty flesh. The pulp cavity of this type is small and may resemble a “marbled” steak–hence the name. This meatiness makes them hold together well when sliced, and the large size makes them great for sandwiches. One slice does the trick! Also referred to as globe or slicing tomatoes, this variety is medium-sized, meaty enough to hold together well, and juicy. The smaller size makes them popular for salad wedges (bite-sized), or sliced to accompany a meal. Measuring less than an inch in diameter, these tomatoes make excellent bite-sized nibbles or tasty additions to salads. Cherry tomatoes are also great for grilling on skewers. Sub-types include grape and currant tomatoes, which are smaller in size but slightly sweeter than regular cherry tomatoes. Also known as Roma, these are egg-shaped tomatoes that have thick skin and flesh. They are less juicy than most other varieties, which makes them good candidates for baking, canning, and broiling. They also do well for sauces and paste. These are dryer than other varieties; many plum tomatoes are also “paste tomatoes.” They are good for making tomato paste and dried tomatoes. When in season, we carry a wide variety of tomatoes starts such as different Heirlooms, Yellow Pear, San Diego, Early Girl, Roma, Cherry, Golden, Beef Steak and so much more! If you don’t have a lot of space, we have solutions to help you grow a few plants in pots. Stock is changing weekly so if you have the space grow as many as you can eat and share!